The black 20.6 cu. ft. Kenmore Elite 28099 oozes beauty. And brains. The 20.6 cu. ft. Kenmore Elite 28099 upright freezer achieves the rare feat of combining loads of thought through storage space, chic and beauty. It mirrors the Kenmore Elite 28092 in every respect except color: it is a black beauty. So what do we put its magic touch down to? Its humongous size, unique color, assorted storage options, frost free defrost operation, energy efficiency, integrated security features, design and warranty. It's hardly surprising then that it makes the coveted bestsellers' list. These are especially important if you have custom-made doors, hallways and cabinetry. The moral of the dimensions? It's got to fit before you can reap its countless benefits. So grab your measuring tape and get busy! The Kenmore Elite 28099 offers 20.6 cu. ft. of storage space so it's a great buy is you have a large family. Time and money are scarce so any appliance that helps you save these should be embraced with open arms. Because of its cavernous capacity, you can go to the store with a longer shopping list, less frequently, saving precious time. And because you buy in bulk, you save money, too. So this freezer kind of helps you conquer both the elusive worlds of time and money. Then you can spend these on the things you love, like a long overdue holiday to your dream destination. Maui, perhaps? Why Did the Kenmore Elite 28099 Pass the Bestselling Test with Flying Colors? Because it's black black black. All black exterior, in fact—cabinet, door and handle. And there are emotional and functional benefits to this. And bingo, the Kenmore Elite 28099 is knocking on your door. From a functional perspective, a black freezer will not show dirt and smudges as easily as a white one. So, if you are not a clean fanatic, this may be the right freezer for you. The Gold Standard in Shelving? If a freezer is as good as the storage options it offers, then the Kenmore Elite 28099 is way up there with the best. What with its assortment of shelves, door bins and slide-out baskets! The degree—and this is not a play on words—of your food organization will depend on how well you put the 6 shelves to use. These shelves are handy for storing bulk purchases such as multipacks. They are made of wire which is far more durable than plastic, assuring you of many years of reliable service. The Kenmore Elite 28099 comes equipped with 5 door bins. These are perfect for storing items that you need to reach quickly, such as frozen donuts and chicken pies. So it's best to keep these hunger-busting goodies in the door bins, where they are easy to reach. The 3 slide-out baskets are handy for storing tiny items that would slip through the wire shelves. 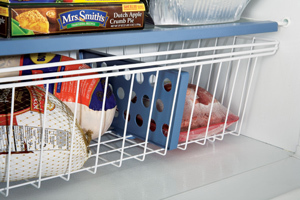 What's more, these baskets can be "slid out" of the freezer in order to restock or empty them. Shelf! Got you! No, this Kenmore upright freezer does not come with pizza. But I daresay it does better—it comes with a pizza shelf. Now you can turn your kitchen into a pizzeria, baking and slicing up Italy's culinary gift to the world on demand. While the pizza has run out, the shelf is happy to host round food items, such as ice cream cakes or frozen yoghurt entrees. Once you buy and portion out half a cow, you need to be sure that it will freeze well. So another thoughtful function comes to the rescue—again! It's the quick freeze function that speeds up the preservation process by dropping the temperature rapidly at the touch of a button, locking in the color, juices and flavor. This Kenmore upright freezer model is frost-free. This is because it has an inbuilt mechanism that prevents ice build-up so that you never have to manually defrost your freezer again. Or empty your freezer in preparation for this exercise. Or mop up the thawing mess. Or bend, squat, kneel or crawl to do any of these. The Kenmore Elite 28099 is an Energy Star. This means that it has been independently verified—by no less than the Environmental Protection Agency (EPA)—to consume at least 10% less energy than identically sized, frost free models. So it consumes 691 kWh of electricity each year, translating to an electricity bill of about $74.00 each year or $6.17 each month. When the annual energy savings are added up, they can amount to hundreds of dollars over the appliance's lifetime. But the fact that it's not an energy guzzler is also good for the environment: it conserves the oil, coal and natural gas resources and, it reduces pollution, making the air breathable for us all. If you live in a high-risk area, investing in a lockable freezer may be the most cost-effective way to out-maneuver thieves. And because it the security feature is integrated, you don't have to incur an additional cost buying separate locking kits that look clumsy anyway. A lockable freezer is also a child safety essential as it prevents curious little kids from accessing the potentially dangerous freezer interior or its contents. This 20.6 cu. ft. upright freezer is part of the top-of-the-range Kenmore Elite range (again, no play on words). That the Kenmore Elite 28092 sits at the apex of the luxurious range means that it confers a raft of benefits that you probably didn't believe would all be attributable to a single model. A 3-way temperature, door ajar and power failure alarm sounds when your food starts heating up instead of staying cool, alerting you to take measures to avert food spoilage. All the main functions such as temperature setting, alarm trigger levels and quick-freeze are digitally controlled, and you can keep yourself informed on the status of each of these with a quick glance at the LCD panel. 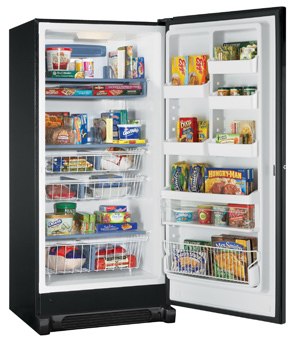 Plus, you can be sure that this black freezer model is as sturdy as a Kenmore upright freezer gets. And you can feel the sturdiness—a cabinet that doesn't dent easily and a handle that won't remain in your hand when you tug at it. You'd have thought that with such a resilient appliance, Kenmore wouldn't have even bothered to craft an elaborate warranty. But things happen. So Kenmore leave nothing to chance. Here, they undertake to remedy, free of charge to you, defective parts and poor workmanship that exist at the time of the purchase. Just remember to keep some proof of purchase on hand, just in case. The regular price of the Kenmore Elite 28092 is $979.99, which is not cheap. Obviously! 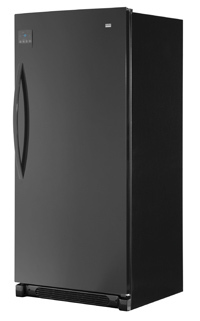 But this black beauty offers a repertoire of benefits that range from multipurpose storage options, frost free defrost system, energy efficiency, security, impeccable design and an industry standard's manufacturer's warranty. What's more, its enormous size and energy efficiency are bound to translate into massive savings. Can you really put a price on the peace of mind that comes with being debt-free?